With 2018 budgets finally firming up, there’s a big opportunity for manufacturers to grow through government contracting this year. B2B, B2C – what about B2G? As one of the largest buyers in the world, the U.S. government procures billions of dollars’ worth of goods and services each year. Within that, federal agencies set aside contracts for small businesses as well as companies owned by women, veterans and other underrepresented groups. With 2018 budgets finally firming up, there’s a big opportunity for manufacturers to grow through government contracting this year. Here’s a few steps to get started. There is a bit of legwork required to get set up as a government contractor – but luckily, there are a variety of resources available to manufacturing companies looking to jump in. A great place to begin is the network of Procurement Technical Assistance Centers (PTACs) located across the country that provide in-person counseling and connections. The U.S. Small Business Administration (SBA) also provides general government contracting knowledge as well as resources created specifically for manufacturing companies, and has a network of offices nationwide. Once ready, any company looking to bid on government contracts must register with the System for Award Management (SAM). Government agencies and primes—companies that hold large government contracts—use SAM to find eligible contractors and teaming partners. Small firms can also create a profile within the Dynamic Small Business Search (DSBS) within SAM for added exposure. A next step is to look for ways to distinguish yourself among the sea of companies also competing for government work. There are a few approaches that may make sense for your business. Women-Owned Small Business (WOSB) — The WOSB certification program helps women-owned businesses enter the federal marketplace and tap into set-aside contracts specifically for small, women-owned firms. Minority Business Enterprise (MBE) – This certification provides resources and opportunities to businesses that are at least 51% minority-owned, operated and controlled. 8(a) Business Development Program: The 8(a) program offers special assistance to qualifying disadvantaged small businesses within certain socioeconomic categories over a span of nine years. The Service-Disabled Veteran-Owned Small Business Concern Procurement Program: This government program allows agencies to set acquisitions aside for exclusive competition among firms that are at least 51% owned by qualifying veterans. Historically Underutilized Business Zone Program (HUBZone): The HUBZone program encourages economic development in certain urban and rural areas by providing preferential access to certain federal procurement opportunities for businesses that operate in those areas. The beauty of many of these certifications is that they bring value to the private sector as well as the public sector. Another way to increase visibility for your company is to research identifying North American Industry Classification System (NAICS) codes, which the SBA uses as a basis for its size standards. In some cases, NAICS codes allow companies to maximize their small business size as long as possible and tap into small business set-asides. Manufacturing companies, specifically, have the flexibility of being categorized as small businesses by number of employees, not by annual revenue. This allows a firm with annual revenues of approximately $50 million to still be considered small within certain qualifying NAICS codes. One of the more recent manufacturing code changes was updated by the SBA in October 2017. Businesses can see which codes were affected here. Trade Organizations: Consider joining industry groups and associations that hold networking events. Many of these events are often attended by agency officials and provide valuable face time with contracting decision makers. Examples include The LEAD Program – GovLEADer Series Program, The HUBZone Council, Women’s Business Enterprise Council and the National Association of Small Business Contractors. Targeted Events: Attend conferences and trainings where you can have direct access to representatives from federal agencies. One example is ChallengeHER, a joint initiative between the SBA, American Express OPEN and Women Impacting Public Policy that focuses on the WOSB Federal Contracting Program. Websites such as FBO.gov and GovEvents.com allow you to search for events and networking opportunities by topic, industry, location and more. Social Networking: Don’t forget you can network online, too! Platforms such as LinkedIn have numerous government contracting-focused groups that can help you build relationships with your peers and agency officials. These online groups are also a great way to learn about upcoming events and opportunities that may be a fit for your business. Check out networking tips here, and learn how to perfect your elevator pitch here. As with all successful endeavors, persistence is key! Don’t be afraid to try any and all opportunities that will help your business gain exposure to the federal government and fellow peers. From certifications and designations to crafting a thoughtful networking strategy, there are a multitude of resources available to help you reach success in government contracting. For more information and additional resources, visit www.sba.gov and www.openforum.com/governmentcontracting. 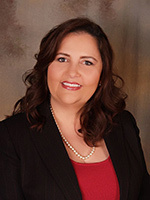 Lourdes Martin-Rosa is the founder and president of Government Business Solutions, a firm based in Miami, dedicated to providing services ranging from program management solutions to implementation. Lourdes also serves as the American Express Advisor on Government Contracting through which she helps small business owners, like herself, access impactful resources and gain the tools needed to become successful in the government contracting arena.